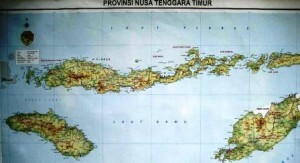 The island of Flores, in Nusa Tenggara Timur, has the highest density of volcanoes of all islands throughout the whole of Indonesia – some 24 in total. The Gunung Bagging website lists 13 volcanoes with prominence of over 1,000 m. Some of the more impressive and accessible volcanoes are described below. With early starts, each mountain can be climbed in one day. 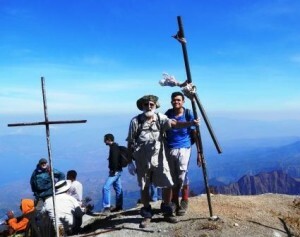 Most take 3-4 hours to climb. Excellent views from mountain tops should be possible during the dry season (about April – September). Some traditional villages, and the stature of Soekarno, the first President of Indonesia, and the house where he was interned in the late 1920s at Ende, can be visited en route. The mountains below are listed from west to east. Go to the Gunung Bagging website for more information and detailed descriptions of each mountain. 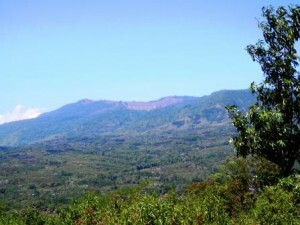 Inerie (2,227 m) is the highest mountain in Flores. It has an almost perfect volcanic cone that has not erupted for thousands of years. The climb takes about 3-4 hours. The upper reaches are on friable, slippery volcanic ash – very laborious. Stay away from deep ravines. The dormant crater is uninteresting but circumnavigation of the rim is rewarding experience with spectacular views from the summit. 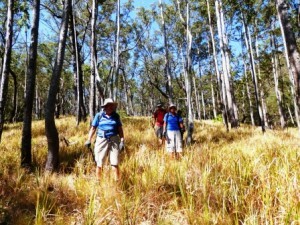 The final ascent from the crater rim to the summit is tricky in places – not for the faint-hearted. 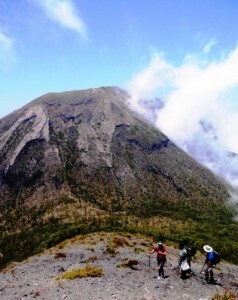 The descent from the summit to the crater rim is steep with care required. Interestingly, Inerie has a long scree slope parallel to the ascent route. After getting the feel of the scree, you can literally run/slide down for several hundred meters making for an easy descent before reaching the grasslands below. 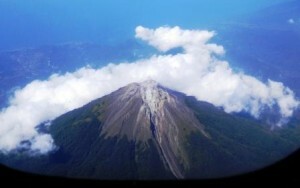 Ebulobo (2,137 m) is occasionally active. Again, the climb takes about 3-4 hours. The climb has some steep sections but on quite solid rock unlike Inerie. 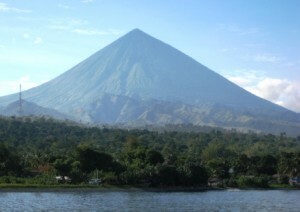 The vulcanology of this mountain is strange – explanation needed! The final ascent to the crater rim is over and around formidable rocks of all shapes and sizes. The most fascinating feature of Ebulobo is its crater. Unlike other craters, Ebulobo’s crater is shallow containing enormous, extruded rocks of strangely irregular shapes and sizes. 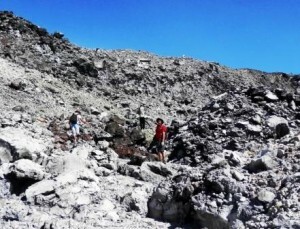 The true summit is reached by scrambling across the crater area over and around these rocks – quite possible with care! The views from the summit are of course spectacular. 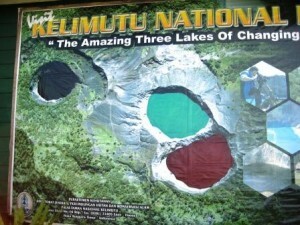 Keliutu (1,647 m) is Flores’ most famous tourist attraction – the three crater lakes of different colours that change colour from time to time. Access to Kelimutu is easy – drive to a parking area below the lakes then a leisurely walk to Inspiration Point from where all three lakes can be seen. 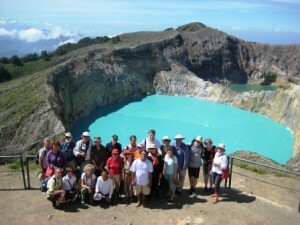 Kelimutu is a ‘must see’ if you have not been there before. Keli Lepembusu (1,754 m) is non-volcanic. If you are into ‘bagging’ peaks, this one is for you. It is nearby Kelimutu – both could be reached in the same day. The peak of Lepembusu is probably the easiest to summit in the whole of Indonesia as there is a Telkom tower on its summit. A road leads direct to the tower – difficult by car as the road is in bad condition (2014); better to take a motorbike. Excellent views across Flores – even better if you are confident enough to climb the Telkom tower. The road up the mountain passes through scenic Eucalyptus savannah and more dense forest higher up. 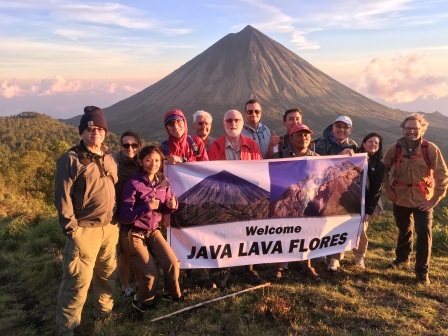 It offers excellent bird watching although there would be no time for this on a Java Lava trip. Egon (1,708 m) is a very active volcano, the latest eruption being in January 2016. 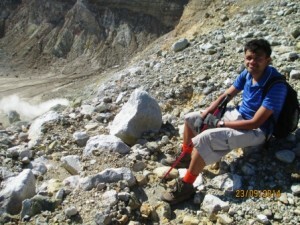 It is also one of the most popular climbs in Flores offering amazing views into its crater and across Flores. 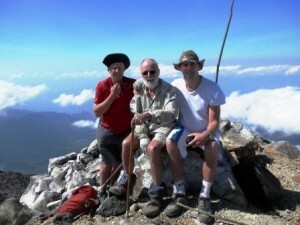 The climb to a low point on the crater rim takes 3-4 hours. From the rim, you can see the very active and noisy fumaroles and a beautiful blue crater lake below, about 350 m across and 200 m deep. The final 100 m ascent to the summit is up steep cliffs but this would be very dangerous unless you are an experienced, properly equipped technical climber. 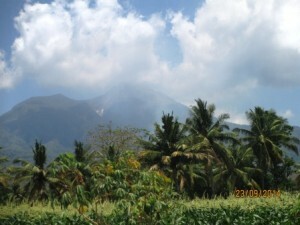 Lewotobi: This spectacular mountain complex is quite unique, consisting of two adjoining peaks known locally as the the husband and wife – Lewotobi Perempuan (female) and Lewotobi Laki-laki (male). Both are active and erupt frequently. The climb is initially through forest where the red-legged megapod or scrub fowl (gosong kaki merah) builds its nests and incubates its eggs in decaying compost. Eventually a creek bed is reached where everyone takes a well earned rest. The climb to this point, through pleasant forest, takes about two hours. From here, you can proceed to either Laki-laki or Perempuan. 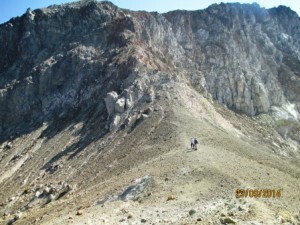 Lewotobi Laki-laki (1,584 m): a scramble up a creek bed over rocks/boulders and, finally, up a steep slope on difficult, friable, slippery volcanic ash to the summit. About two hours. The view into the crater, about 400 m wide, is awesome – a volcanic pipe descending into the bowels of the earth. Lewotobi Perempuan (1,703 m): from the creek bed, the trail proceeds through beautiful open Eucalyptus forest until reaching the saddle (1,232 m) between the two peaks (about one hour). The climb from here takes about another two hours (about 500 m). Beyond the bare rock of Perempuan’s outer rim lies the inner rim of the impressive main crater (about 700 m across). This may contain a lava dome, yellowish in places due to the sulphur, depending on the mountain’s state of activity. The rim is steep, crumbly and slippery so do take extra care. Again, spectacular views. Laki-laki or Perempuan can be climbed in one day but not both. Perempuan will take a bit longer. Be prepared for returning to the trail head in the dark – head lamps. Acknowledgements: Dan Quinn and Nick Hughes for material used in compiling these profiles.